This recipe can either be done on your outdoor grill using the indirect cooking method, or in your oven. It is an instant hit and something you will be proud to serve! If you have the luxury of getting your pork tenderloin from a butcher, do it! You can ask the butcher to butterfly the meat for you or you can do it yourself. The idea is to end up with one large, flat piece of meat that you can stuff like a jellyroll with the fruit inside, roll up and tie for roasting or grilling. 2. 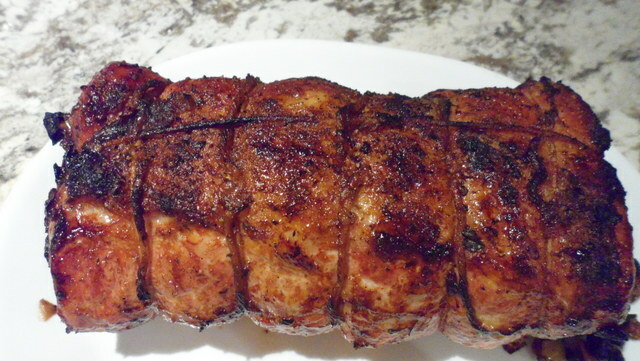 After you have butterflied the pork, make your glaze. 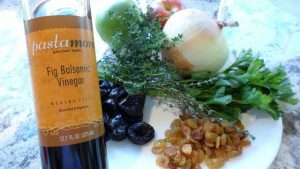 In a small sauce pan, pour in the fig balsamic and white wine and cook over medium high heat. 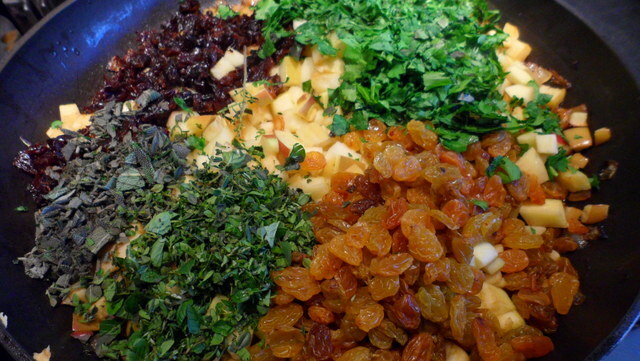 Let it reduce by about ¼ and add the garlic and herbs. Let it reduce to about ½ the original volume and set aside. 3. 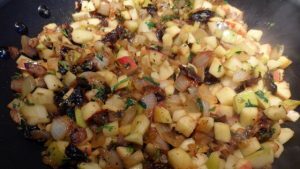 In a large skillet over medium heat, sauté the onion until caramelized (about 10 minutes) Add the garlic, apples, raisins, prunes and fresh herbs, salt and pepper to taste. 4. Pour in ¼ cup white wine and about 2 Tablespoons fig balsamic vinegar. Let the mixture cook until the apples are just tender. Cool mixture before handling. 5. 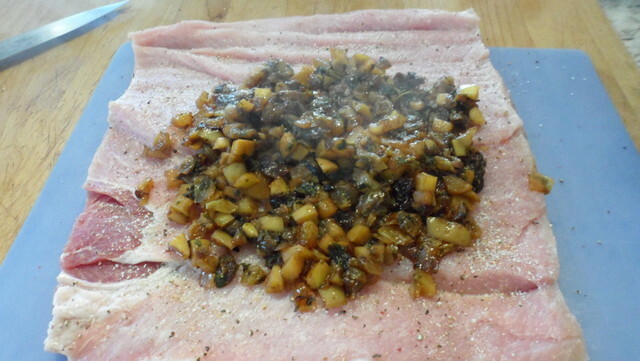 Lay the meat out on a flat surface and spoon a layer of stuffing on the cut side (the inside) of the meat, keeping it a couple of inches from the end. Roll jellyroll fashion and tie with string, securing ends as well. 6. Brush the roast with just a little of the prepared glaze and drizzle with olive oil. Sprinkle with salt and freshly ground pepper to taste. 7. 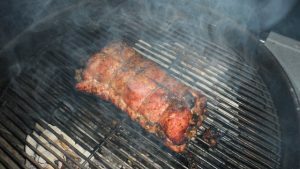 My choice for this recipe is to grill the meat on an indirect barbeque (coals/heat on either side of the meat, keeping the temperature at 350 degrees with a white ash on the coals and keep the lid on!). 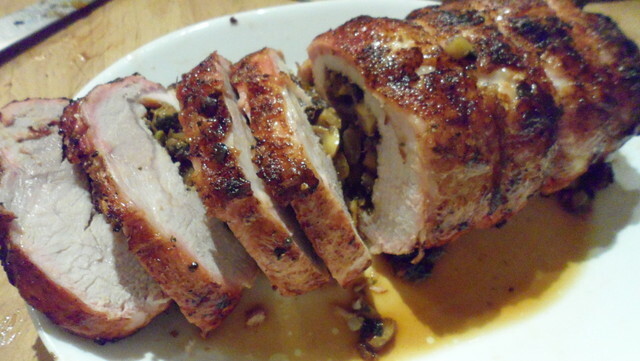 *If you choose this method, let the meat cook, undisturbed for about 16 minutes per pound. 8. 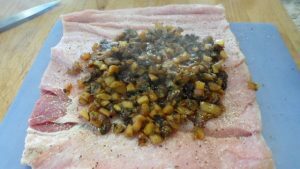 During the last 10 minutes of cooking, quickly remove the lid from the barbeque and sprinkle the maple chips over the coals. 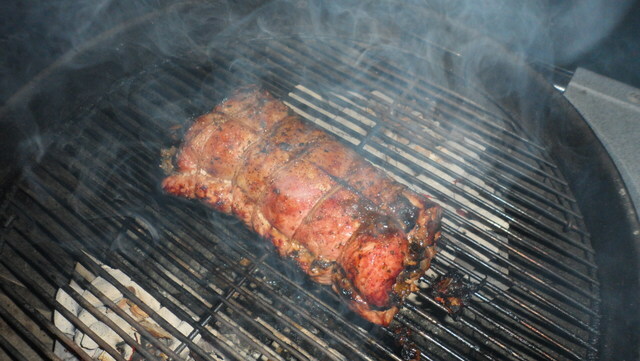 Baste the roast with the reserved glaze and re-cover the barbeque as quickly as possible. Let the heat return to 325 to 350 degrees and allow to cook for the remaining 10 minutes. 9. If you are cooking in the oven, use a pre-heated 350 degree oven and cook the meat uncovered in the lower 1/3 of the oven for 16 minutes per pound. 10. The last ten minutes of cooking, turn up the oven temperature to 425 degrees, baste the roast with the reserved glaze and continue to roast for 10 minutes until beautifully golden. 11. 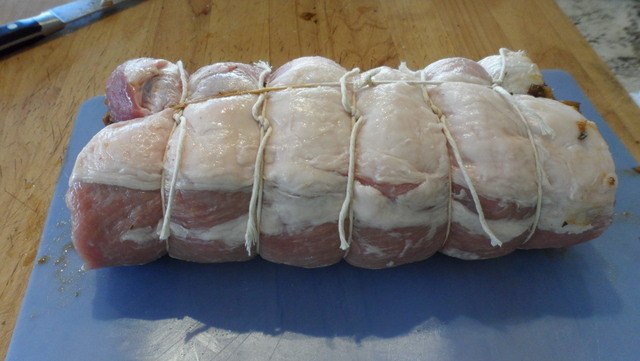 Whatever cooking method you use, a most important step is to let the meat rest for at least 15 minutes before slicing. 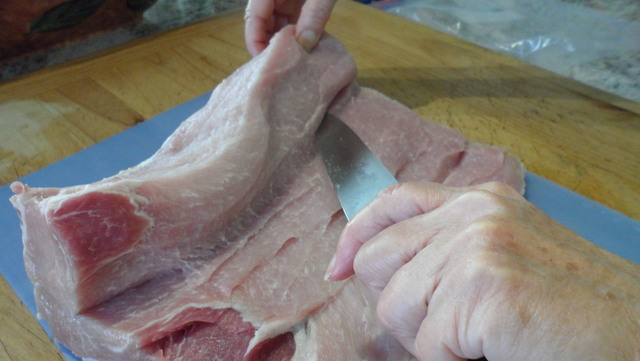 You can cover the meat with a piece of aluminum foil or just let it set. 13. Slice the meat with a very sharp knife and drizzle with glaze just before serving. This is just delicious served with garlic mashed potatoes and grilled or roasted asparagus with brown butter sage sauce.